Overview - Baseball all-star Cory Brand knows what it takes to win in the big leagues. But off the field, with memories of his past haunting him, his life is spiraling out of control. Hoping to save her client's career and reputation after a DUI and a team suspension, Cory's agent sends him back to the small town where he grew up. Forced to coach the local youth baseball team and spend eight weeks in the only recovery program in town, Cory can't wait to return to his old life as quickly as possible. As his young players help him experience the joy of the game, Cory discovers his need to find freedom from his past and hope for his future … and win back the love he left behind. With this unexpected second chance, Cory finds himself on a powerful journey of transformation and redemption. Before starting this review, I think it's important to note a few things. First off, 'Home Run' is a Christian themed film aimed at spreading a positive, religious message through its story -- one that will predominately only appeal to those who already agree with its viewpoint. For what it's worth, I don't exactly fall into that demographic (to put it lightly). With that in mind, those who enjoy movies with heavy religious themes and evangelical goals should probably take this review with a big old grain of salt. I'm simply not the audience the filmmakers are going after. Still, as I mentioned in another review I wrote for a similarly Christian themed sports flick ('Seven Days in Utopia'), I have no bias against productions of this type and am at the very least open to watching movies that examine beliefs different from my own. That is, as long as they're still well made films -- and 'Home Run' sadly can't quite slide into home on that front. Actually, I'm not sure it even passes second base. After getting suspended for misconduct related to his alcoholism, Major League Baseball star Cory Brand (Scott Elrod) is forced to return to his hometown and attend rehab. While reluctantly going through the Celebrate Recovery program he reconnects with his brother and his former girlfriend (Dorian Brown). As part of his attempts to clean up his public image he also volunteers to coach one of the town's little league teams. Faced with a possible new start, Cory wrestles with his demons and tries to overcome the mistakes of his past. For all intents and purposes this is a mostly harmless and positive film -- but it's also quite generic, dull, relatively amateur, and disappointingly simplistic. Though there is some attempt to depict the struggles of addiction, Cory's journey toward recovery is generally bland and far too saccharine. And it doesn't really help that Scott Elrod's performance is completely one-note and kind of annoying. He starts off coming across as airheaded and irritating, and by the time the credits roll, he ends up coming across as… well, airheaded and irritating. While the writers actually do a decent job of not hitting the audience over the head with the film's Christian themes for most of the runtime, the climax becomes much more overbearing. The movie's ultimate solution for the character will only appeal to those who agree with the filmmakers' religious ideology, and will likely come across as too easy and unrealistic for those who don't. I'm not saying that the Celebrate Recovery program doesn't help many individuals through its teachings in real life, but as presented here, Cory's transformation just isn't given the development and nuance that it needs to be believable. The character gets angry and drinks every now and then, but there really aren't many dramatic turns here, and the movie's second and third acts feel stagnant, uneventful, and comically predictable. The whole little league team aspect has some promise, but this potentially amusing coaching plotline is totally skimmed over, and none of the individual kids get much screen time. That is, with the exception of Cory's ex-girlfriend's young son -- whose age just so happens to perfectly correspond with the amount of years it's been since Cory left town. You know, give or take about nine months of course (hint, hint). The rest of the runtime is filled with similarly clichéd and formulaic subplots, and coupled with the lack of engaging drama or comedy, it just doesn't feel like much happens. 'Home Run' is a well meaning family film that has its heart in the right place, but the movie's examination of addiction is simplistic and overly saccharine. To his credit, director David Boyd does create a solid visual style and, with the exception of its climax, the movie mostly avoids overbearing religious commentary. Still, this is clearly a production with evangelical goals in mind, and as such it will likely only appeal to a certain audience. Unfortunately, I'm simply not among that group, and even ignoring its Christian themes, the filmmaking just isn't very interesting. It's a competent effort, but not much more. 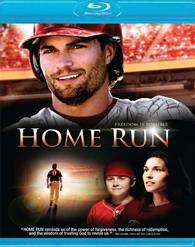 Millennium Entertainment brings 'Home Run' to Blu-ray on a BD-25 disc housed in a keepcase with a cardboard slipcover. Instructions for a VUDU HD copy are also included. After some skippable trailers and a brief introduction from former MLB player Brett Butler and current MLB player Ben Zobrist about the film's inspiring Christian themes, the disc transitions to a standard menu. The release is region A coded. The movie is provided with a 1080p/AVC MPEG-4 transfer in the 1.78:1 aspect ratio. Though the film does look a bit cheap and amateurish at times, the image is relatively sharp and clean. With the exception of some minor banding and occasional noise, the digital source is free of any major artifacts. With that said, a few establishing shots of locations (particularly the baseball stadium) look like they come from lower grade sources and have an upconverted appearance. Still, overall detail is good with strong clarity. The film does have a comparatively flat appearance, however. Colors look a little drab and washed out in some outdoor shots, but saturation remains fairly pleasing. Contrast is a bit blown out, though black levels are solid with decent shadow delineation. The cinematography is very basic, but outside of some unobtrusive artifacts, the transfer is technically sound. The film is presented with an English Dolby TrueHD 5.1 track and optional English SDH and Spanish subtitles. Generic and uneventful, the mix gets the job done but does little else. Dialogue is clear and clean. The track's sense of space is pretty small, with a mostly front-loaded presentation. Some effects, like crowd reactions and crickets, do offer some minor ambiance and directionality but the sound design has a very basic sense of immersion. Isolated sounds, like a bat hitting a home run, do come through with ample kick and the movie's inspirational soundtrack does feature nice fidelity and pleasing range during various swells meant to tug at our heart strings. Showing its limited budget, there really isn't a whole lot to the film's mundane sound design. The track is technically proficient, but the audio doesn't do much to create a natural, enveloping soundscape. Millennium Entertainment has included a small and inconsequential collection of supplements. All of the extras are presented in standard definition with Dolby Digital 2.0 audio and no subtitles unless noted otherwise. Around the Bases (SD, 7 min) - Here we get a behind-the-scenes featurette with the cast and crew. The participants reveal that the script didn't originally have a religious aspect, and that the Celebrate Recovery storyline was added at the suggestion of producer Carol Mathews who felt that the Christian themed positive message was impressed upon her by the Lord. Other details involving the characters' paths, and the movie's hopeful, God related message are shared. Freedom is Possible (SD, 4 min) - In this featurette, pastors and other religious figures discuss and praise the movie's Christian themes. Baseball Super Stars Praise Home Rune (SD, 3 min) - This is just a series of quotes from Christian baseball players praising the film's faith based content. National Center for Fathering (SD, 2 min) - This is a PSA for the National Center for Fathering. Be a Dad (SD, 1 min) - Here we get another brief PSA about being a good father. 'Home Run' is a competent but generic Christian themed family film. Its message about addiction is well meaning, but the script is simplistic in its examination of the topic. The video is solid and though very basic, the audio gets the job done. Unfortunately, the supplements are little more than fluffy promo pieces. The movie has some clear issues, but its heart is in the right place. Still, this is a release that will likely only appeal to fans of evangelical films.